Sony is reforming it’s PC and TV business, all over the world. And the first step has already been taken: They are selling it’s Vaio PC & Laptop business to Japanese electronics giant Japanese Industrial Partners (JIP). As per the press release, Sony is concentrating hard to “reform” it’s TV and “Post-PC” products such as mobiles and tablets aimed at accelerating the revitalization and growth of its electronics business, and hence have decided to handover entire PC and Laptop manufacturing and marketing operations to JIP. Sony wants its existing VAIO customers and their employees to be taken care of by an able partner and JIP has a proven track record in these metrics. As part of the business transfer, Sony will cease “planning, design and development” of Personal Computers and Laptops from now on. 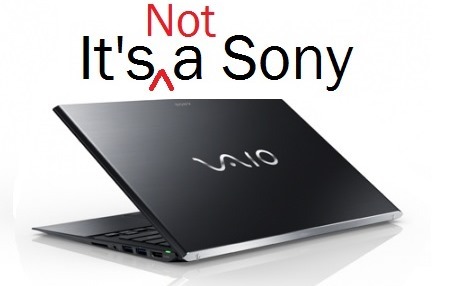 After Spring of 2014, Sony will entirely stop manufacturing and sales of its Vaio products, globally. The good thing is that even after this business transfer, all existing Sony VAIO customers will continue to enjoy their customer service. Around 250 to 300 Sony Corporation and Sony EMCS Corporation employees would be hired by JIP management. These employees are part of Vaio PC operations, including planning, design, development, manufacturing and sales. Some of the employees would be shifted to other divisions within the company and the rest would be given an early retirement option. In another news, it has been reported that Sony plans to cut around 5000 global jobs, across all divisions. Out of these 5000, 1500 employees are based in Japan alone. Sony VAIO, which stand for ‘Video Audio Integrated Operation and ‘Visual Audio Intelligent Organizer’ was launched in the year 1996, and for the last 18 years, it has strived to maintain top quality in the industry. But for the last 3 to 4 years, it’s positioning in the market has suffered a lot as it’s sale has kept on decreasing despite it’s efforts to boost up the sale. Sony now plans to solely concentrate on the two hottest verticals where they are experiencing unprecedented growth: Mobile and Games. It’s Xperia series is already a hit and as per latest financial statements, mobiles have witnessed 45% growth in sales. In gaming division, its PS4 consoles have been a big hit as more than 4 million units have been sold in the month of December alone. But, it’s an iconic end to an iconic brand. If you are an owner of Sony Vaio series, what do you think of this decision? Sony should have continued with it? Do share your views by commenting here!